Updated: Sega GameGear, Game 1000 and Master System (BigFred). Main GBA dat release #2290. 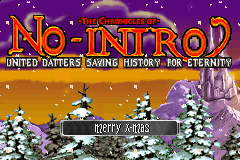 The No-Intro Headquarter whishes MERRY CHRISTMAS to all collaborators, friends and haters. Without you all, we weren't here. Updated: VBA.INI (pandylib), NES (BigFred), C64PP (bigmax) and GBA e-Reader. Updated: Nokia N-Gage, N64 and Amiga SPS (SolidSnake). Main GBA dat release #2289. Main GBA dat release #2283. Main GBA dat release #2282. Updated: VBA.INI (pandylib) and GBA e-Reader. Main GBA dat release #2274. Main GBA dat release #2272. #1098 and #2207 were redumped (3C83C18E -> AE2A69F3), (79EB1176 -> A0AEC80A). Updated: NES (BigFred) and GBA Hardware (CM). Main GBA dat release #2263. Main GBA dat release #2261. Updated: NES (BigFred) and GBA. Main GBA dat release #2254. Main GBA dat release #2250. 22-nov-2005: Main GBA dat release #2247. 20-nov-2005: Main GBA dat release #2243. Main GBA dat release #2241. Back to the glorious old days with a couple of fresh 0-art intros! Main GBA dat release #2240. Main GBA dat release #2234. Updated: GBA Betas, Hardware and e-Reader. Main GBA dat release #2232. Updated: SNES, GB, GBC, WSC (NGEFreak). coolhj updated his great GBATA! Download version 0.7 from our site. Forums were moved to another URL. NDS section available for registered users. Main GBA dat release #2231. Updated: SMS (bigfred) and Megadrive (Gigadeath). Main GBA dat release #2225. Main GBA dat release #2220. 05-nov-2005: Main GBA dat release #2218. 04-nov-2005: Main GBA dat release #2215. Updated: vba-over.ini (Pandylib) and SMS (BigFred). Main GBA dat release #2212. Updated: N64 (SolidSnake) and SMS (BigFred). Main GBA dat release #2209. Thanks to SolidSnake. 28-oct-2005: Main GBA dat release #2206. 27-oct-2005: Main GBA dat release #2202. 26-oct-2005: Main GBA dat release #2195. 23-oct-2005: Main GBA dat release #2191. 19-oct-2005: Main GBA dat release #2183. #2177 was overdumped (just trim to 32Mbit). Main GBA dat release #2181. Main GBA dat release #2173. Main GBA dat release #2168. Updated: GBC and SNES (NGEfreak). Main GBA dat release #2167. Updated: N64 (SolidSnake), Sega Genesis (Gigadeath) and GBA Hardware. Main GBA dat release #2166. Main GBA dat release #2163. Updated: Amiga SPS and N64 (SolidSnake) and GBA e-Reader. Main GBA dat release #2162. 02-oct-2005: Main GBA dat release #2160. 01-oct-2005: Main GBA dat release #2158. Main GBA dat release #2156. Main GBA dat release #2154. Main GBA dat release #2152. Updated: C64 PP (Bigmax), GB, GBC and SNES (NGEfreak), Amiga SPS and N64 (SolidSnake). Main GBA dat release #2151. From today, we support ClrMamePro's www-profiler feature. More informations in Dats section. Main GBA dat release #2149. Main GBA dat release #2133. #0475 and #0476 are underdumps (32 -> 64 Mbit), main GBA dat updated. Still needed the redumps of #0106 and #0107. 16-sep-2005: Main GBA dat release #2132. 13-sep-2005: Main GBA dat release #2130. #0938 was redumped (0B95F3A2 -> 49E012A8), (banause). Main GBA dat release #2124. #0604 was redumped (6C9154E4 -> 31F85DBE), (ElFuego). Main GBA dat release #2122. Main GBA dat release #2119. #2115 was an overdump (64 -> 32 MBit), (Paga). Updated: Commodore Amiga SPS and N64 (SolidSnake), Sega Mega Drive (Gigadeath) and GameGear (BigFred). Main GBA dat release #2116. Updated: C64, C64pp, Plus4, Vic20 (bigmax). Main GBA dat release #2115. Redump of #2103 (BF14676C -> 4B96B600), (BigFred). Main GBA dat release #2108. Updated: SNES, GB and GBC (NGEfreak). Main GBA dat release #2105. Main GBA dat release #2103. Updated: SMD (Gigadeath), Amiga SPS, NGP and GBA Hardware (SolidSnake). EZTO redumped #0374 (7BE03B08 -> 07195201). Main GBA dat release #2101. Main GBA dat release #2100. ElFuego redumped #0917 (422FA12F -> B250366C). Main GBA dat release #2099. 21-aug-2005: Main GBA dat release #2096. 19-aug-2005: Main GBA dat release #2094. 18-aug-2005: Main GBA dat release #2092. 17-aug-2005: Main GBA dat release #2090. Updated: GG (BigFred) and Commodore 64 PP (bigmax). Main GBA dat release #2086. Main GBA dat release #2084. 12-aug-2005: Main GBA dat release #2081. 11-aug-2005: Main GBA dat release #2079. Updated: Commodore Amiga (SPS), N64 (Solidsnake) and GBA Cracked. We don't support NDS system. Dumps aren't perfect, system is too recent. Priority are others. But if you need a dat, Solidsnake created and will mantain a NDS 'semiofficial' dat, similiar to the others around. You can find it in our NDS Corner. Updated: Genesis/Megadrive (Gigadeath), thanks to ElBarto and Omega288. 05-aug-2005: Main GBA dat release #2075. 03-aug-2005: Main GBA dat release #2073. Updated: GBA Hardware and Cracked. Main GBA dat release #2069. Main GBA dat release #2065. Redumped #1321 (78A3289C -> 8AC558CE), (TimePie). Main GBA dat release #2064. 22-jul-2005: Main GBA dat release #2063. 21-jul-2005: Main GBA dat release #2059. 19-jul-2005: Main GBA dat release #2058. Main GBA dat release #2057. Updated: GG and NES (BigFred). Are you feeling all the love we are spreading? Main GBA dat release #2050. Updated: ChannelF, CreatiVision, GBA Cracked, N64 and Amiga CAPS (SolidSnake). Main GBA dat release #2049. TimePie redumped #1287 (0BABCAB9 -> 03BBC0C9). p.p. redumped #1188 (C9D127AC -> 7DA6CC69), #1206 (C6D5132D -> B9DEA90D) and #1339 (326B320F -> 00911694). Main GBA dat release #2045. Updated: NES-Wip, SMS and GG (BigFred). Main GBA dat release #2044. Updated: N64 and RCA Studio II (SolidSnake). Main GBA dat release #2041. Main GBA dat release #2040. Main GBA dat release #2038. Updated: GBA Beta, GBA Cracked, N64 (SolidSnake), PCE and NES (bigfred). Main GBA dat release #2036. Updated: Sega Genesis / Megadrive (Gigadeath). Main GBA dat release #2034. Updated: C= 64, C= Plus4, C= Vic-20 and RCA Studio II (bigmax). Updated: GBA Cracked and MultiBoot. Main GBA dat release #2031. From Coolhj, the coder of GBATA, we are proud to present you the public beta1 of NDS Top System. More informations in our section "GBATA / NDSTS". Updated: Entex Adventure Vision, Fairchild Channel F and Pokemon Mini (SolidSnake). Updated: N64 and Amiga Caps (SolidSnake) and GBA Cracked. We announce you Unofficial No-Intro PJ64 RDB v2005.06.18 (SolidSnake). Redumped #1284 (C45D26EA -> A41D22AD), (BigFred). #2024 is overdumped (128Mbit -> 64Mbit), (BigFred). Main GBA dat release #2025. Main GBA dat release #2020. Updated: MD (GigaDeath) and VBA-INI (Pandylib). Main GBA dat release #2019. Main GBA dat release #2018. Redump of #1485 (52DE7123 -> D47BF1D4), (TimePie). Main GBA dat release #2012. Updated: GB and GBC (NGEfreak), GG and SG1000 (BigFred). Main GBA dat release #2011. Main GBA dat release #2009. As requested by the author, we removed the MegaCD dat, because it was too at an early stage. Main GBA dat release #2008. Main GBA dat release #2007. Updated: Amiga Caps and N64-wip (SolidSnake). p.p. redumped #1316 (87210525 -> 1D27165A), (BigFred). Updated: Megadrive/Genesis and 32X (Gigadeath). Main GBA dat release #2005.
p.p. redumped #1035 (AEFACBB3 -> 57438E39), #1341 (BD3AE9D7 -> 5F41C9FE), and #1340 (F949585E -> A6FC701F), (BigFred). Updated GBA dats. p.p. redumped #0704 (6C04250E -> A1288427) and #1257 (374D48D2 -> 72EB35E3), (BigFred). Updated GBA dats. Main GBA dat release #2003. Updated: N64-wip and Game Wallpapers (SolidSnake) and NES-wip (BigFred). Main GBA dat release #1999. Main GBA dat release #1996. Updated: Megadrive (Gigadeath) and NES-wip (BigFred). Updated: SNES and GB (NGEfreak) and PCE (BigFred). 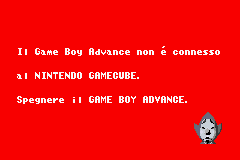 Main GBA dat release #1994. Updated: N64 (SolidSnake) and NES-wip (BigFred). Main GBA dat release #1993. Main GBA dat release #1992. Updated: GB and GBC (NGEfreak), GBA Beta, GBA Cracked, GBA Multiboots. Main GBA dat release #1986. Main GBA dat release #1980. Updated: Megadrive (Gigadeath), N64-wip (bigfred), GBA Beta. Redumped #0003 (4B99700F -> D9516E50), (bigfred). Main GBA dat release #1978. Main GBA dat release #1975. Updated: GBA Cracked, GBA Beta, GBA Hardware. Main GBA dat release #1974.
pandylib did a nice VBA INI file. Main GBA dat release #1972. 22-apr-2005: Main GBA dat release #1969. 21-apr-2005: Main GBA dat release #1966. 19-apr-2005: Main GBA dat release #1963. Updated: SMS (BigFred), SNES (NGEfreak), N64 (SolidSnake). Main GBA dat release #1961. Main GBA dat release #1958. Main GBA dat release #1956. The deface was obviously fake... because today (only today?) we are FoOl. Main GBA dat release #1954. Updated: SMS, GG and SG-1000 (BigFred). Main GBA dat release #1952. Updated: GBC (NGEfreak), Megadrive (Gigadeath) and SMS (BigFred). Main GBA dat release #1951. Main GBA dat release #1950. Updated: Fairchild Channel F (SolidSnake). Main GBA dat release #1949. 22-mar-2005: Main GBA dat release #1946. 21-mar-2005: Main GBA dat release #1942. Main GBA dat release #1941. Updated: Amiga CAPS (SolidSnake), SMS and GG (BigFred). Main GBA dat release #1940. 18-mar-2005: Main GBA dat release #1937. 15-mar-2005: Main GBA dat release #1933. 14-mar-2005: Main GBA dat release #1931. #0718 redumped (C41081CF -> B2477B72), (TimePie). Updated: MSX and MSX2 (Gigadeath) and GBC (NGEfreak). Main GBA dat release #1929. Main GBA dat release #1928. Main GBA dat release #1926. #1126 redumped (1EE9FBA8 -> 63F49BA9), (TimePie). Main GBA dat release #1925. #1745, #1746 and #1748 were redumped. Main GBA dat release #1924. 01-mar-2005: Main GBA dat release #1923. 27-feb-2005: Main GBA dat release #1918. Intro from cracked #1883 removed by Disruptor. Main GBA dat release #1916. 25-feb-2005: Main GBA dat release #1914. 23-feb-2005: Main GBA dat release #1907. 22-feb-2005: Main GBA dat release #1905. 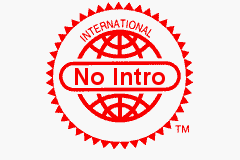 Visit http://nointro.free.fr/ to find *all* No-Intro dats converted for OfflineList. Great Work! And we remember you the GbaFront No-Intro dat by http://emuconnie.mysite.wanadoo-members.co.uk. Main GBA dat release #1902. Main GBA dat release #1901. Main GBA dat release #1897. Updated: PCE (BigFred) and GB, GBC and SNES (NGEfreak). Main GBA dat release #1895. Main GBA dat release #1894. Main GBA dat release #1893. Main GBA dat release #1886. New version (0.6a) of the great coolhj's GBATA. Main GBA dat release #1884.
coolhj asked us to suspend the links to his GBATA, that includes an important bug that needs a fix. Main GBA dat release #1881. Main GBA dat release #1880. Main GBA dat release #1879. 30-jan-2005: Main GBA dat release #1876. 28-jan-2005: Main GBA dat release #1872. #1869 is overdumped (correct: 64Mbit), (BigFred). #1041 needs a bit of more fixing (9CC99C59 -> 08794743), (Dopefish). Main GBA dat release #1871. 20-jan-2005: Main GBA dat release #1868. 18-jan-2005: Main GBA dat release #1867. 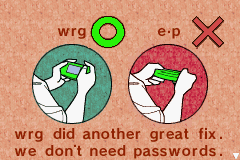 We changed the crcs of #1307 (023A9A75 -> 88513763) and #1595 (46493FA1 -> A84032AA). Main GBA dat release #1866. 13-jan-2005: Main GBA dat release #1865. 10-jan-2005: Main GBA dat release #1863. Beta version of MSX2 in Forum (Gigadeth). Main GBA dat release #1860. Updated: Atari 5200 and Pokemon Mini (SolidSnake), SMS and GG (BigFred), Commodore Plus 4 (bigmax). Work in progress: MSX2 (Gigadeth). Main GBA dat release #1856. Main GBA dat release #1855.